The structural work for the Navy’s next Ford-class aircraft carrier, the John F. Kennedy, is now 70 percent complete, according to a Feb. 22 Huntington Ingalls press release. Kennedy, like the most recently manufactured aircraft carriers, is being built in stages of large, completely outfitted sections at the Newport News Shipyard. The sections are being built outside of Dry Dock 12, where the ship is being assembled, and are lifted into place by a “superlift,” the yard’s 1,050-metric-ton gantry crane. From there, the sections are welded into place. 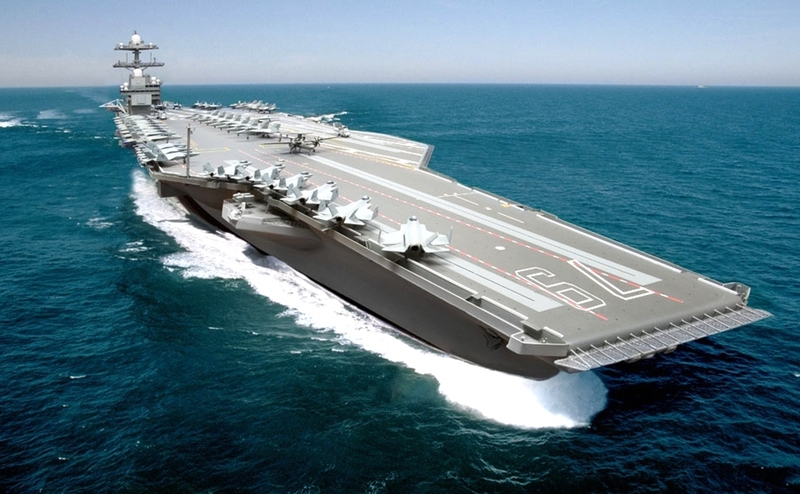 A congressional watchdog report has recommended the U.S. Navy develop a new cost estimate for a future aircraft carrier being built in Virginia. The most recent lift, which put the Kennedy’s structure at over 70 percent complete, came in at 806 metric tons, 171 feet long and about 92 feet wide. The structure is made up of berthing areas, electrical equipment rooms and workshops, and it took 18 months to build.